Scoop 1 to 1½ teaspoon into palm of hand. Warm by rubbing between hands until it transforms into a nourishing oil. Distribute evenly throughout hair and scalp. Repeat steps 1- 3 until hair is fully saturated. Comb through and allow to penetrate for 20 minutes before rinsing and shampooing. For overly damaged hair, apply gentle heat from a hairdryer for 5 minutes or alternatively leave the treatment in overnight. Be sure to place a towel over your pillowcase or wear a shower cap over your head to protect bed linens. Use weekly. Follow with Damage Reverse™ Restorative Shampoo and Restorative Conditioner. Finish with Damage Reverse™ Restorative Smoothing Glaze and Restorative Finishing Spray for optimum daily benefits. 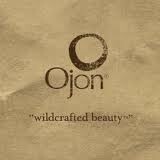 Ojon™ Restorative Hair Treatment is not recommended 5 days prior to or following color or chemical service. Ojon oil - known as "nature's golden elixir", this now-legendary oil is rich in essential lipids similar to those in unprocessed, virgin hair. Found only in the rainforests of Central America and harvested and extracted by hand from the nuts of the fragrant Ojon tree, this amazing beauty secret has been used for centuries to restore perfect health and vitality to "hair broken by the blazing sun"
A really effective treatment after just one use. My hair felt flat and looked a little dull before I used this. After just one treatment it looked shiny and felt healthy. A really effective treatment that nourishes, gives a great shine and finish to my hair. Comes with a comb to give maximum results when applying. If you can leave it on overnight you get even better results. Hair looks and feels healthy, shiny and clean. My first reaction was URGGGH! And it didn't get much better. There are very few beauty products I'm offended by, but this is one of them. This is a good conditioning treatment, but the revolting scent really lets it down. The pot is more practical than a tube. Leaves dry/frizzy hair incredibly soft. Horrendous smell - the fragrance is a mixture of tar, coffee and orange, and within 10 minutes, I smelled like a 3 day old ash-tray. Looks disgusting - a very thick, grainy, oily, brown liquid. Difficult to apply - very messy and difficult to comb through my very thick hair. A good conditioning treatment if you can stomach the scent. I had started using this before I was diagnosed with cancer & was amazed that it softened & improved the loook, shine & texture of my very long, thick, curly hair which has a tendency to frizz. After my op, my oncologist said that chemo would greatly improve my chance of not getting again. My first thought was my mane. OK I had always said it was a problem to style and I would love straight hair but I never said I didnt want any! I decided to have my hair cut short so the weight help pull it out & undergo the cold cap treatment whilst, as it kept my hair soft and not as hard to detangle, contuing to use this and other products in the range.....no chemicals so fitted the bill perfectly. Used a tangle teaser to make sure it covered every strand of hair and SUCCESS.....my hair did thin a bit but not enough to show. I applied it when I got home from each treatment & would leave it on for days at a time as I only washed my hair when necessary since it only seemed to come out then. A pot seems to last for months on end even though I use it weekly (now shoulder length). I still leave it on overnight and find the scent very appealing like a vanilla forest. Doesnt mark the pillowcases any more than any other oil teatment & that washes out easily. Softens hair after first use. I kept my hair during chemo using this & the cold cap treatment against onc. assurances that I would lose it. Will never be without a pot. An excellent conditioning product for dry or damaged hair. Deeply hydrating and calming properties. Very effective. Strong aroma that some may find offputting. Time consuming application process. This product is amazingly effective, the solid balm quickly becomes liquid in the hand and can be smoothed over the hair. After washing the hair is intensely moisturised and calmed. All frizz and damage become imperceptible. Amazing But Biizarre Texture Mask!! What a bizarre but amazing product!!! 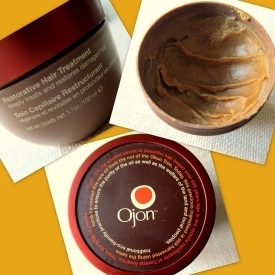 Ojon products are not cheap but they are worth every penny for their benefits on your hair! The Damage Reverse range is designed for dry and damaged hair. I am now on my second pot of this treatment and I have to say, when I received my first product I was stunned at the consistency and look of it. Inside the pot the product is a solid balm which looks like a cross between caramel and chocolate! The pot comes with a small spatula to remove the balm from the tub. When you scrape some out it is a dry flaky consistency which seems almost impossible to apply to the hair. This is until you warm it between your palms. The balm then melts into an oil which you then run through your hair to coat it evenly. A small downside for me is that my hair is so long I have to repeat this process several times to coat my hair! The balm is made from pure Ojon Oil which closely matches the oil of virgin hair. It contains no parabens, artificial colours or fragrance and no harmful chemicals. Combined together the ingredients help to smooth and repair the hair shaft whilst giving it strength, health and restore natural moisture. The fragrance is quite unbelievable! My whole family have used this product and we all stand very much divided on the fragrance! You will either love it or hate it. My original pot had the old fragrance which was quite a pungent tobacco, earthy smell, which whilst strong is not unpleasant. Ojon have now changed the fragrance to a lighter one which reminds me of a woody chocolate orange. Quite honestly each nose detects the fragrance differently. Once applied to the hair and combed through (this is quite a lengthy process for longer hair) you can either leave the product on for 20 minutes and then shampoo and condition as normal. I personally use this as a much longer mask or overnight treatment which I believe gives better results. I apply to my hair and then cover with a shower cap over night. Sadly you will smell this repeatedly during the night but I love the fragrance so this does not concern me. You also need to use the Damage Reverse shampoo and conditioner when removing the product otherwise you will be undoing the hard work and benefits of the mask if your use chemical based products. After washing and drying my hair is unbelievably soft, smooth, shiny and bouncy and any split ends, dryness or frizziness has completely disappeared! The pot is long lasting due to its concentration. I personally believe that you get much better results from this product the longer you leave it on your hair so I would suggest bearing this in mind if you purchase. I simply adore this range. Nature at its best! !